Summary: Despite a negotiated end to its political crisis, Yemen is still deeply divided between the official government and at least three separate armed groups which existed even before the recent turmoil. For a description of the beginnings of Yemen's popular uprising and the first version of this conflict map from last July, see Yemen Fragments Under Uprising. A previous updated version of that map can be seen in the News Bits: October 2011 article. Since last fall, the conflict in Yemen has undergone something of a change in direction. In November President Ali Abdullah Saleh finally signed an agreement with the Joint Meeting Parties, a coalition of opposition politicians that includes Nobel Peace Prize winner Tawakkul Karman. Under the deal, brokered by the Gulf Cooperation Council, Saleh would yield the presidency in February to vice president Abd Rabbuh Mansur Al-Hadi via a symbolic election. After the power transfer went forward as planned last month, opposition militias have mostly ended their conflicts with the government, and unarmed protests have decreased (but not ended altogether). The city of Taiz, referred to as the heart of Yemen's revolution, has been largely demilitarized, and the streets of Sana'a no longer see frequent violence. 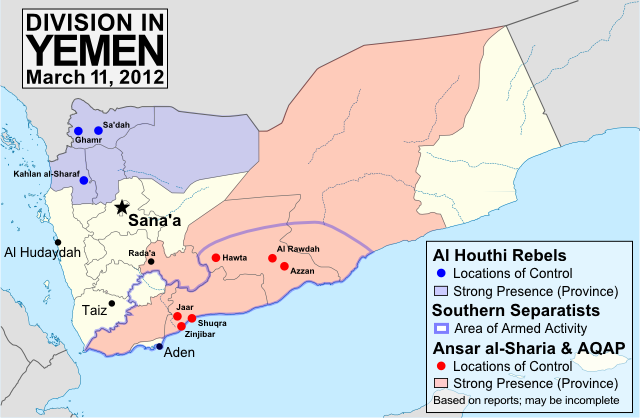 Ansar al-Sharia & Al Qaeda in the Arabian Peninsula (AQAP): These two apparently connected groups of Islamic extremists took advantage of the chaos of the revolution to carve out their own territories in southern Yemen. Ansar al-Sharia now controls much of Abyan and Shabwah provinces, including hotly contested Zinjibar, as well as its recently declared "Islamic emirates" in both Jaar (which they renamed Waqar) and the eastern Shabwah region. Al Qaeda affiliate AQAP operates widely in the country, and in January briefly captured the town of Rada'a before withdrawing after negotiations with local leaders. Ansar al-Sharia and AQAP have played no part in the peace process, and are sworn enemies of nearly all other major political groups in the country. The Al Houthi Rebels: The Houthis are a Shiite insurgent group that has fought several wars for autonomy from predominantly Sunni Yemen since 2004. During the beginnings of last year's uprising, the Houthis solidified control over their home region of Sa'dah in the far northwest of the country, and have recently extended their power to the three surrounding provinces as well. The group's leadership has called for participation in the national reconciliation process, but boycotted voting in last month's single-party election. Only time can tell whether the Houthis' territories will be integrated into Yemen or again erupt into full-blown rebellion. The Southern Separatists: Ever since North and South Yemen united in 1990, southerners wishing to re-secede have become a major political force in the country. Many of the separatists use peaceful political methods, but there are also insurgents who occasionally make attacks on the government in the name of southern independence. These separatist militants played only a small part in the uprising last year, but have recently become more active, denouncing last month's election and even going so far as to attack polling stations. Though they do not solidly control any territory, they still form a major threat to unity in Yemen. Further Reading: Land of the Black Flag - Journalist Casey Coombs visits and photographs the Ansar al-Sharia stronghold of Jaar, the so-called "Islamic Emirate of Waqar".